Annotation: CIA director Thomas Stansfield is dead - a fact many individuals in and around the nation`s capital are pleased to hear. But their happiness proves to be short-lived once they learn that Stansfield`s successor is the late director`s close friend and protege, Dr. Irene Kennedy. Her plan of action is to pursue the very goals Stansfield established -- something Stansfield`s fiercest enemies don`t want to hear. And something they refuse to accept. Meanwhile, Israel has discovered that Saddam Hussein is close to entering the nuclear arms race -- and they`ve vowed to stop the Iraqi madman before he can get his hands on the ultimate weapon. With the Middle East teetering on the preciplce of chaos and devastation, the president of the United States is forced to act. The commander in chief`s secret weapon? None other than the CIA`s top counterterrorism operative, Mitch Rapp. 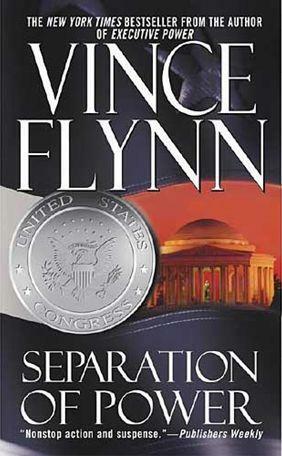 With action that sizzles and true-to-life insider detail, SEPARATION OF POWER showcases NEW YORK TIMES bestselling author Vince Flynn at his shell-shocking best.